When you search for making money from home articles on this website, you’ll see lots of ways to start side hustles with the intention of either making you an impressive side income or replacing your full-time job with a new business. 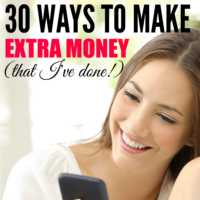 Two of the most popular ways to make money from home are never really talked about. So I thought it was time to address why. There are three super popular companies that let you make money from home in your spare time. I get asked about them *all the time*. So, let’s dig into what they are, how much you can make and why I never talk about two out of the three. The most popular ways to make money from home are Swagbucks and Inboxdollars. They have such similar business models that I’m lumping them in together. They pay you a small amount to take surveys for marketing research, watching videos, playing games, and reading emails. You can also earn to search the internet. Nope! It’s totally legit and they will definitely pay you. You can be paid in gift cards or in cash (via paypal). It doesn’t cost anything to sign up (actually they pay you $5 to try them out). The problem is that I think it’s really crappy pay for the time it takes you to complete and the work likely isn’t something you're passionate about. I also hate that this will put you on your phone or computer all day and keep you from having meaningful interactions with people. (although- I realize that my hate of smartphone dependence is my issue and not yours). 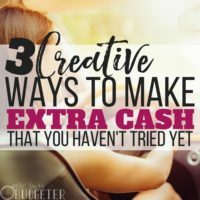 If you’re looking to earn some fun money and replace your candy crush addiction with these companies and you have no desire or interest in ever having a business or a side hustle for yourself, then go for it! You can sign up for Swagbucks here. You can sign up Inbox Dollars here. I will say that although I don't really like these companies, readers love them and swear by them. I have a reader (who you can thank for this post because she emails every month telling me how much she’s made from them) that consistently makes $150 – $200/month with Swagbucks. You can use both to double your earnings potential. You can find out more about Inboxdollars here. You can find out more about Swagbucks here. But, I think you could do so much better by starting a side hustle that you love as a hobby and working to turn it into part-time (or even a full-time business). User Testing pays people to test out websites. You don't need any special skills (some tests require you to have a background that relates to the sites that you’re testing, but most don’t). They pay $10 for a 15-20 minute test or $3 for a 5-minute test. Your computer is recorded, but you aren't, so they record your mouse movements and your voice as you talk your way through the site. For example, if you're testing a popular clothing site for women. They may ask you to browse for a dress to buy for an upcoming wedding that's under $125. As you log into the site, you’re going to tell them what you think like “Oooh! I love the shoes on the front page, now I want shoes too!”, or “Why is your “sort” feature on the right side of the screen when every other website I use is on the left side? That’s really annoying”. Website owners use your feedback to make their sites better and shopping easier. I do this and LOVE it. It’s crazy easy money, you get “first look” at a ton of new features or sites from really famous companies (you’ll sign a lot of NDA’s here so you won't be able to tell anyone about them), and I think it’s just a really fun way to make money. The money is automatically released to you 7 days after you earned it directly to your paypal account, which you can then transfer to your bank. I’m SO not tech competent (kind of funny considering I earn a full time income blogging), and even I found it easy to do the tests. You just download their program and then press a button to start. Is it a scam? Nope! 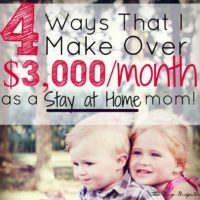 This is a way to make money from home that I highly recommend! You can sign up to be a user tester here. I just started using Swagbucks. It is easy and definitely worth it. The only thing is sometimes I forget to login when I am making a purchase online. Do you have the swag “button” on your browser? It’s so helpful. If you go on a site that has a cash back offer, it tells you and reloads it automatically to get you credit! Ok, you talked me into it. I am going to try the User Testing thing. I recently started a blog so the money from User Testing could go towards web design and such for the blog. Thanks for the article and at home money making ideas! Rosemarie, do you have a microphone or do you use the one from your computer? Great info! I’ve never heard of swag bucks. 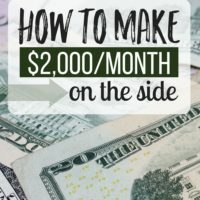 I’m interested in making a full time income from freelancing and blogging and this post is very insightful. Thank you for this article! I have been using UserTesting for about 3 months now and I love it! I do have to agree that survey sites do take A LOT of time for minimal pay, but I have been using them during “down time” like waiting in the doctor’s office or when I get my oil changed. Since it adds up slowly this way, I’ve set the goal of using the earnings toward my Christmas budget. So far, it’s added nicely to my funds. Yeah I adore Swagbucks. Wrote my own blog post about it, but everything I do to earn allows me to just sit my phone down and let it run. I actually spend less time on my phone because it’s making me money playing videos and I don’t want to interrupt those. I don’t like Inbox Dollars because it seems to be too time consuming. I keep meaning to try user testing but haven’t made the effort yet. I didn’t like Inbox Dollars at all (it seemed kind of scammy to me), but I do like Swagbucks. I generally limit myself to the daily task list and I do surveys while I’m watching TV in the evenings. Between that and the points earned by using their links to make online purchases, I usually get enough bucks for a $25 per month. You absolutely do not have to sit staring at your computer or phone all day.